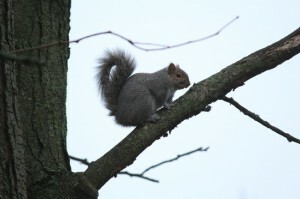 Grey Squirrels were introduced to Ireland from North America around 1911. The species quickly established itself and rapidly spread throughout the country. They cause significant damage to certain species of tree and pose a serious challenge to the continued existence of the native red squirrel. Every year Grey Squirrels cause millions of euro in damage to trees on forestry, woodlands, country estates, stud farms and golf courses. 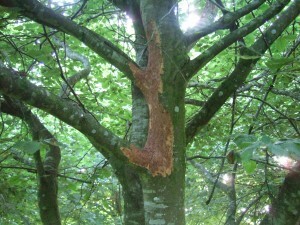 They usually tend to attack beech, sycamore, elder and hazel trees between 10 and 40 years old, although this will vary depending on the species of tree. They attack trees by first stripping the bark from around the trunk and branches (commonly known as bark stripping), discarding it, and then feeding on the soft vascular tissues underneath. This will most likely result in serious discoloration or death of the tree. They are more likely to cause damage to trees during the time period during which the carbohydrates stored in the tree roots is flowing upwards to the branches and leaves between March and August. The spread of the grey squirrel has been mirrored by a worrying retraction in the number of native red squirrels. Our native reds are simply out-competed by the larger and more robust greys who have a more varied diet and can eat acorns before they are ripe. Greys can also act as a carrier of the parapox virus, which has a deadly effect on native red squirrel populations. In Ireland and Britain grey squirrels are classified as vermin, in fact the National Parks and Wildlife Service actively encourages control of their numbers. Effective control can best be achieved through a humane and structured programme of shooting and trapping. Wildlife Management Services have been providing effective management programmes for squirrels for the last 10 years and are experts in the field. Please click on Infestation Removal for some further information. Please contact us at 087 6410206, 057 8623042 with your grey squirrel problem.